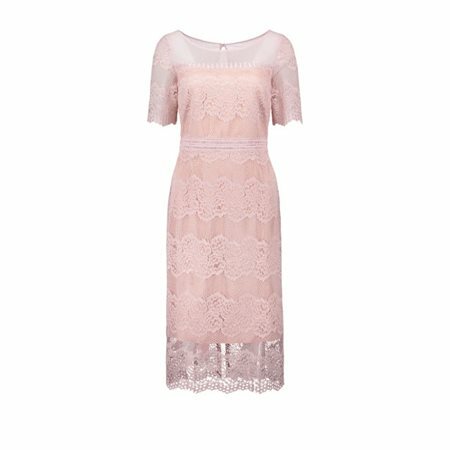 Vera Mont have created this stunning lace dress in a pretty blush rose colour making it a perfect choice for the party season. The dress has been beautifully designed with short sleeves and a deep scooped neckline that features a delicate lace finish. The dress is fitted at the waist to flatter your silhouette, it closes at the back with a hidden zip and keyhole detail. The lace falls over a rose coloured underdress allowing it to sculpt your body in a most elegant manner. This dress is knee length with the hemline finished with the same delicate lace edging. We think this creation by Vera Mont will be a popular choice for a special occasion.